Enter on the Manhattan side of the bridge, near City Hall, from Park Row and Centre Street. To get there, take the 6 train to Brooklyn Bridge-City Hall or the J train to Chambers Street. Go up the concrete ramp. Once you hit the wooden planks, you're officially on the bridge. Make sure you stay clear of the bike lane! 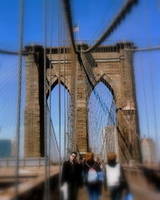 The Brooklyn Bridge is often crowded, and cyclists have little concern for meandering walkers. Enjoy the views. You'll be able to see some of Manhattan's most famous structures, including the Woolworth Building and the Empire State Building, from the bridge. Don't miss the Statue of Liberty, which will appear on your right. When you've had your fill of walking the Brooklyn Bridge, exit on the Brooklyn side. When you exit the bridge, go south on Front Street until you hit Old Fulton Street. Turn right. Grimaldi's is located at 19 Old Fulton St. If the line at Grimaldi's is too daunting, try eating dinner at any of these restaurants near the Brooklyn Bridge. If you're in the mood for something more upscale, the River Café sits on the water and offers more gorgeous views of Manhattan. Not in the mood for a meal? Make your way to the Brooklyn Ice Cream Factory on Water Street for a refreshing treat.